Thirty, forty, fifty, sixty years plus – it could be for you? You often hear people say – I always wanted to learn to climb but I never had the time or the opportunity. With Monsterclimbs it’s never too late to start a lifetime of fitness. Statistics and research have proved that climbing is one of the best ways to become and stay fit. People who have been climbing since they were young are still as fit and able in their 60’s as they were when they were in their 20’s – and usually with better technique. 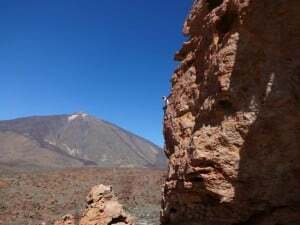 And the reason for this – climbing is one of the few physical activities that encompasses the mind, body and soul. Physically it is a whole body activity. It will develop aerobic fitness by walking briskly to and from the crag, by climbing long easy routes and scrambling to more remote areas. It improves anaerobic fitness as you attempt climbs with more powerful and dynamic moves. It develops muscular endurance, especially working on circuit boards or climbing long sustained routes. It will improve the flexibility of your joints, stimulating the production of synovial fluid that maintains healthy joints as well as moving in and out of positions you wouldn’t think physically possible. Any exercise will strengthen bones preventing the onset of osteoarthritis and climbing is no exception. The nature of climbing ensures that your co-ordination will improve; you often have to move parts of your body into different positions, changing between eye to hand co-ordination, to eye to foot co-ordination to route reading often in mid movement. Your next hold might be behind you or off to the side so you develop spacial awareness too. Your body composition will change inevitably if you climb regularly. You are defying gravity by using your arms and legs to move up a rock face whilst maintaining static and dynamic balance, which as well as developing your core muscles in the abdomen and back will tone up your legs and arms. It’s one of the best ways of getting rid of muffin tops and bingo wings. You also begin to realise that if you could shed a few pounds it would also be a lot easier to defy gravity as you would be carrying less weight up there with you and you may actually start to eat a little healthier. Using your own body weight as resistance training is one of the best ways to tone and strengthen the muscles and once you start to change the angle i.e. steeper, you will also develop muscular power and improve core strength. As you develop your climbing skills, you are going to improve your mental state – you are learning many new skills, and learning keeps the mind alert and healthy. It stimulates the mind and lifts the spirits. Once you are ready to begin lead climbing it becomes a different sport altogether and this is when the mind and body unite. 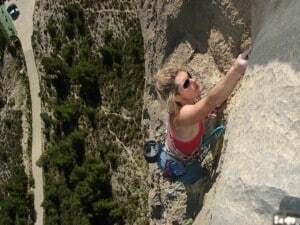 Lead climbing is much more technical and has the potential to be more challenging. You have the potential to take a leader fall and have to consider each foot and hand placement and how far you are from the next gear placement. Your whole life becomes drawn into this singular activity. You are focused, in the zone, nothing else intrudes on your thoughts, your worries and problems dissipate and it is pure escapism. You feel part of the rock and the landscape and are at one with yourself. Climbing enriches your soul – it enables you to access areas of outstanding beauty in a way that few people ever experience. It starts at the local climbing wall and leads to the rest of the world. The only limits are those you set yourselves. And finally, there is the social side to climbing. You meet like minded people who become lifelong friends. 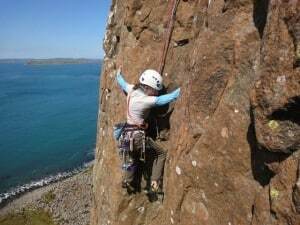 You can join local climbing clubs, you can go on trips in the UK and abroad with friends, clubs and commercially organised ventures. And what could be better after a long physical day climbing in a warm winter climate than to chill out at a local restaurant for a relaxing evening of food and good cheer with your buddies. never used any of my injuries as an excuse to give up or lose my enthusiasm for climbing – it has become part of who I am and I am as fit and keen as ever. So…… it’s never too late. Strike whilst the iron is hot. Make hay whilst the sun shines. Just DO it. If you have any questions or want to book a course do not hesitate to contact me – Miss Ali Taylor.